We now carry these beautifully crafted clip-ons for your vintage race bike or cafe racer! 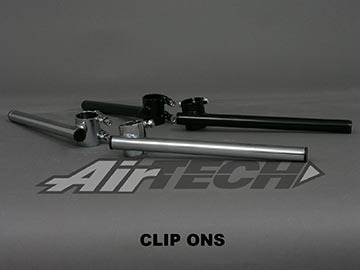 Our clip-ons have 8mm stainless allen bolts. Bar length 11" (9" from clamp to bar end) so plenty of room for large vintage master cylinder. Bar angle a pretty mellow 12 degrees so these clip ons do not put your wrists at some crazy angle but allow you to tuck in comfortably. Excellent TIG welded construction. 7/8" bars fit most Japanese and European applications. Comes with plugs on the fork side, open ends for bar end weights or mirrors. Additional bar end plugs available separately. Larger sizes available in black powder coat also! 32mm fits many small bore European bikes like Ducati singles, Gilera etc. 34mm fits Yamaha RD350, RD400, some small bore Suzukis. 36mm fits Kawasaki KZ1000, KZ650, 88-07 EX250, 87-93 EX500 and many more. If you're not sure what size you need give us a buzz and we'll try to help you out. These rubber mounted brackets are made of aluminum with a chrome steel clamp and look great on vintage cafe racers. Our 7/8" clubman handlebars are perfect for your vintage race bike or cafe racer, because the will bolt straight to the bar clamps on your top triple clamp. They are not quite as low as clip ons and have a little bit less of a reach, so usually a bit more comfortable. These clubman bars are a great for small bikes with like CB350, RD350, RD400 or other application with a narrow front end including many drum brake front ends. These are designed for bigger bikes with disc brake front ends, great for many 70's bikes like CB750, XS650, KZ1000, GS1000 etc. These will fit many modern bikes as well! The center of these is 1.5" wider so the bars can be clocked into the right position without hitting the top triple clamps. We've shortened the bars a bit so the overall width of these clubman bars is the same as the standard ones. Knurled centers. You asked and now you will receive... The same wide clubmans but in a 1" bar diameter to fit Hinckley Triumph Bonneville, Harley Davidson, certain Buells and anything else with 1" bars. You asked and now you will receive... The same wide clubmans but in a 1" bar diameter to fit Hinckley Triumph Bonneville, Harley Davidson, certainy Buells and anything else with 1" bars. Our classic drag bike handlebars, 7/8" version. If you need additional plugs for your clip ons, clubman handlebars or any other 7/8" bar for that matter, grab a pair of these. Black plastic plugs for 7/8" OD bars. Sold in sets of two. Finally a clean switch that does not look out of place on a vintage bike, will work as a kill switch, headlight switch or anywhere a positive on/off switch is required. Also great for custom builds, drag bikes, race bikes etc. 2-wire, for 7/8" bar. Simple, clean switch that combines 2-wire kill switch (positive) and starter button (momentary). Also great for custom builds, drag bikes, race bikes etc. For 7/8" bar. The switch housing is only 7/8" wide so narrow enough to fit between a push-pull race throttle and the brake lever. These are the best pure road race grips available. We put these on our race bikes and a lot of vintage builds. Excellent grip for cafe racer or any go-fast project you may have. Skinny grip with diamond pattern provides excellent feel. Open ended for bar weights or bar end mirrors. These cool vintage grips provide tons of feel and a bit more vibration reduction than the road race grips above, which makes them perfect for endurance racing or long rides. They are made of a soft and very grippy silicone rubber, without being squishy, they are juuuust right... Five grooves for lockwiring if you're so inclined. These cool black/grey grips are our preferred grips for vintage sportbikes. They are dual compound with a durable, firm black tube and flange and a softer, grey center surface providing great grip. They are more comfortable than GRIP1 and firmer than GRIP2. A perfect compromise for a road going sportbikes but they work great at the track, too! Two grooves for lockwiring.